FOREIGN MINISTER FRATTINI: Good morning. 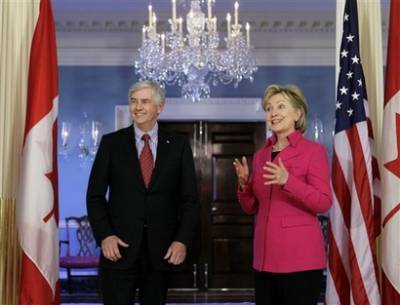 SECRETARY CLINTON: I am pleased to welcome the Italian foreign minister. It’s always good to see our friends from Italy – reliable partners and leaders on so many important issues. We have a very broad agenda to discuss, and I am delighted that we could have this opportunity. FOREIGN MINISTER FRATTINI: Thank you very much. 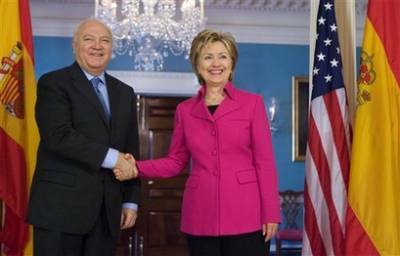 I am very grateful to Madame Secretary Hillary Clinton to have the opportunity to discuss very important points. I’m here, first of all, to confirm the full commitment of Italy, of the Italian Government, to work completely and very closely with the United States on international issues that are of common interest, ranging from Afghanistan and Pakistan, to Middle East, nonproliferation, and of course, strengthening Euro-Atlantic ties. 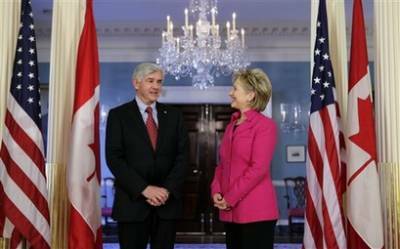 SECRETARY CLINTON: Thank you so much, Minister Frattini. FOREIGN MINISTER FRATTINI: Thank you. lf of the United States Government in thanking the delegations led by the foreign ministers for coming to Washington for these three valuable and unprecedented days of trilateral United States-Pakistan-Afghanistan talks. These have been in-depth, very specific, open, forthright, and I believe extremely useful. Our basic purpose was to exchange views on the strategic issues now being reviewed in our policy review by the Obama Administration. That goal has been amply fulfilled. Now, these meetings would have been valuable even if they had simply been bilateral. If we had met with our Pakistani friends, if we had met with our friends from Afghanistan, that would have been important. 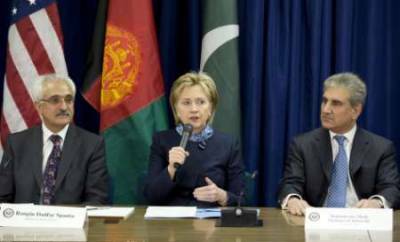 But what makes these last three days especially meaningful is that they were trilateral. We have all been working together. There have been numerous meetings, including the full delegations, a dinner last night, and of course, this meeting today. I therefore am very pleased to announce that we will continue this new trilateral format on a regular basis. Our next meeting is tentatively scheduled for late April or early May. I thank my friends and colleagues. Both ministers have been extraordinary, eloquent, making very important statements. The representatives from both the civilian and military sectors of both governments have been not only forthcoming, but very receptive, listening one to the other. And I thank you for these talented delegations and for your participation and support. Our three nations have a common goal, a common threat, and a common task. And my government commits itself to our friends and to the success of this common endeavor. 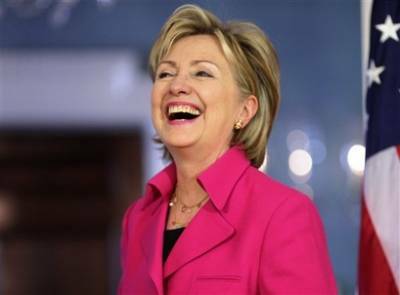 SECRETARY CLINTON: Good morning. I was delighted to welcome President Sejdiu and Prime Minister Thaci and Foreign Minister Hyseni to the Department of State. I congratulated the president and the prime minister for Kosovo’s progress in its historic first year as an independent state. And it is a great privilege and honor to see the many accomplishments of Kosovo since the terrible time of repression and war 10 years ago. The president and prime minister and I discussed the economic and political tasks ahead and the need to provide an increasingly secure and prosperous life for the people of this country. The president and prime minister outlined their vision of a multiethnic democracy at peace within itself and with its neighbors. The vision is reflected in Kosovo’s flag, whose stars represent the different peoples – Albanians and Serbs, Roma, Bosniacs, Turks, and others – who have their home in Kosovo. I emphasized that the United States, working with our European partners, will continue to extend strong and substantial support for the world’s youngest democracy. I am just absolutely delighted, Mr. President and Mr. Prime Minister, to welcome you to Washington. 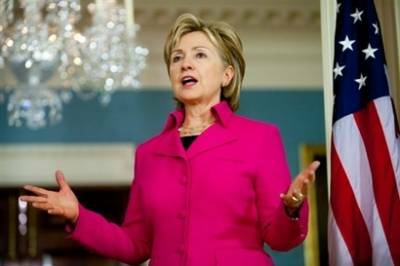 SECRETARY CLINTON: Can we just stop one second? Why don’t we bring Ms. Osmani out, and she can use a microphone out here, so that when the president finishes we’ll have consecutive translation; otherwise, none of the press will be able to hear a word that that the president says. 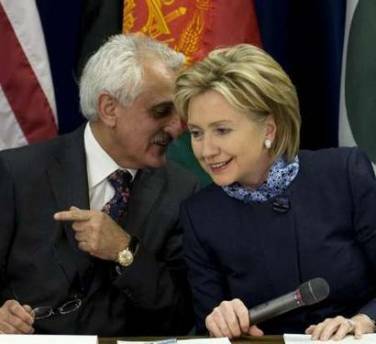 SECRETARY CLINTON: So if we could get Ms. Osmani – in fact, Ms. Osmani, come stand – is there a microphone there that’ll work? Or here. Come stand with me. This young lady is the chief of staff to the president. She did an excellent job interpreting for us when we had our meeting. So we’ll have the president speak, and then we’ll have Ms. Osmani speak. MS. OSMANI: Thank you, Madame. PRESIDENT SEJDIU: (Via interpreter) Once again, I would like to thank you, Madame Secretary, for this great opportunity to have discussions with you for the challenges in front of us and for the developments in our country, and to extend the gratitude of the people and the institutions of the Republic of Kosovo for the continuous support that the United States of America have given continuously to the Republic of Kosovo. Without the role of the United States of America, Kosovo and its people would not have achieved this point of very important development and progress, and this has been a constant role of support that was given by all the administrations of the United States of America. Of course, we had a brief discussion about the developments that have happened in Kosovo during the past year. We marked the first anniversary of the independence of Kosovo, the anniversary of the happiness of the children and the people of the Republic of Kosovo. This has been a year of Kosovo’s chance to prove itself as a democratic, multiethnic state, a state for all its citizens despite of their ethnicity. And it is a year where Kosovo has proved itself as a good neighbor for all the other countries around and its approach for good, neighborly relations with the countries. We had the chance to express our vision that Kosovo is essentially interested to become a part of the European Union and NATO, and with a special bond and a special friendship that will continue forever with the United States of America. Kosovo has so far been recognized by 55 countries throughout the globe, and we were delighted to get a confirmation from the United States of America that we will continue to get their support in also getting the recognition from other countries, and also the support for a speedy economic development of our country, and the support for our vision to create a country which is democratic and a country for all its citizens. As I always say, God bless America and its people. We truly believe and we have faith in the United States of America, in President Obama and Secretary Clinton and her team, and all the people of the United States. We know that we will never be left alone. Thank you very much. 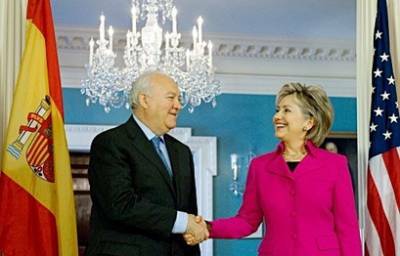 SECRETARY CLINTON: Thank you, Mr. President. Thank you. Mr. Prime Minister. 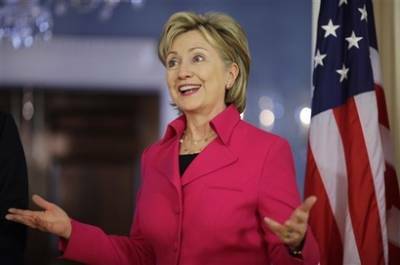 SECRETARY CLINTON: It’s all right. I’m still new. 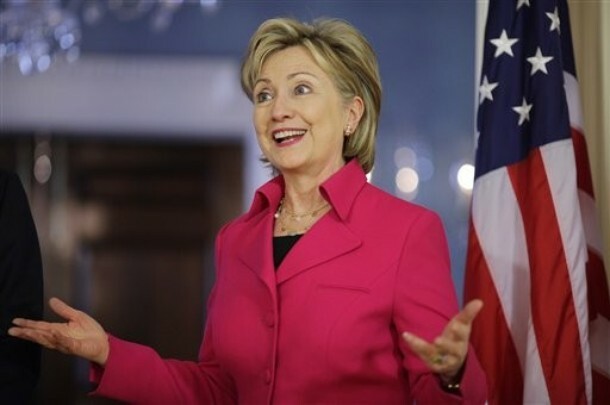 PRIME MINISTER THACI: (Via interpreter) Madame Secretary Clinton, the people of Kosovo shall forever remain grateful, and the memories of your support to them will always remain fresh in their minds. They shall always remain grateful for your help, the help of the American people, and the help of the U.S. Government. We are very proud for the common work, the common progress that we have achieved. A few days ago, we marked the first anniversary of the independence of our country; of course, a year with a lot of progress, but with a lot of challenges at the same time. We have been recognized by 55 countries and we have faith that a lot of more recognitions will come. We have installed good governance, which is transparent, multiethnic, and effective. At the same time, we are building a democratic order, a state that has privileged treatment and an affirmative approach towards all the minority communities. In the very near future, we expect Kosovo to become a member of the International Monetary Fund as well as the World Bank. We are building our state and respecting the territorial integrity of our country. The independence of Kosovo has brought more peace, more stability, and more regional cooperation and a lot more of European perspective. On behalf of the Government of the Republic of Kosovo, I would like to once again extend the gratitude for the support that you have given to Kosovo. I would like to thank you for your position on Kosovo and for the position of President Obama on Kosovo. The relations between the United States of America and the Republic of Kosovo will always remain excellent, Kosovo and its people vow in front of the United States of America and its people. SECRETARY CLINTON: Thank you so much, Mr. Prime Minister. PRIME MINISTER THACI: Thank you very much, Madame Secretary. Thank you. MR. WOOD: The first question from Sylvie Lanteaume of AFP. 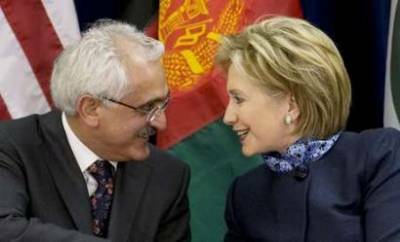 QUESTION: I have a question for both President Sejdiu and you, Madame Secretary. Mr. President, the UN Yugoslav war crimes court today acquitted the former Serbian president who was accused of war crimes in Kosovo. Are you disappointed? SECRETARY CLINTON: I’m sorry. I couldn’t hear what you said. QUESTION: Yes. And so I wanted to know if relations are thawing with Damascus. PRESIDENT SEJDIU:> (Via interpreter) Of course, we at all times have full trust in the verdict of the International Court, but at the same time, I have – I must emphasize that each and every court case needs to be analyzed in the best way possible. Enormous crimes, crimes against humanity took place in Kosovo, in Bosnia, and Croatia. And these murders were – crimes were committed by people who were leading the politics at that time. We call these murders with premeditation. Of course, there was always a person that led all of these genocidal policies against our country, but there were also those that were complicit to the crimes that were committed. Unfortunately, parallel to the very high number of victims that Kosovo suffered as a result of the war, there is also a very high number of people, over 2,000 people, that are still missing in Kosovo, and their families know nothing of their whereabouts. For the families of those who lost their loved ones and who are missing their loved ones, the only spiritual thing that would help them get – feel better would be justice for those who committed the crimes. SECRETARY CLINTON: As to your second question, we have regular interaction with the Syrians as a part of our normal diplomatic efforts. You know, it is too soon to say what the future holds. Obviously, we are working very hard, as is our Special Envoy, George Mitchell, to engage with not only the Israelis and the Palestinians, but all of the neighbors in the region and beyond. And we are going to pursue the commitment that we stated when we appointed our special envoy to try to bring parties together for peace and stability in the Middle East. QUESTION: My apology on my voice. Madame Secretary, what’s your view on Belgrade’s destabilizing behavior and obstruction toward the consolidation of a new democracy in Kosovo? What will be future assistance of United States on building a practical democracy and economic development in Kosovo, and in helping the process of recognizing Kosovo’s independence from countries that they did not yet? QUESTION: — for the Kosovo delegation. (Via interpreter) Mr. President and Mr. Prime Minister, we see you again at the Department of State within a very short time, meeting with the Secretary of State. I wanted to ask whether this means that this is another confirmation of the U.S. Administration for the support given to Kosovo. SECRETARY CLINTON: Well, let me answer your question by starting with the question you asked the President and the Prime Minister. Support for Kosovo is bipartisan. It has been continued now into three administrations, starting with my husband, President Clinton, President Bush, and now President Obama. And as I told both the president and the prime minister, the United States stands with and behind Kosovo, and will continue to work with your country. To that end, we are very pleased that 55 countries have recognized Kosovo, and we are encouraging many others to do so. We think it is in the best interests of many countries throughout the world to recognize this new democracy and to support it. I also admire the way the president and the prime minister have proceeded in dealing with the remaining challenges posed with territorial integrity on your borders, internally, in dealing with your neighbors, particularly Serbia. I think that the very calm and reasoned, careful approach has earned Kosovo a lot of appreciation and admiration throughout Europe and beyond. So as we deal with these problems, we will work with Kosovo. We will continue to help Kosovo try to resolve the remaining challenges that you face. But I think by any fair measure, the last 10 years has been miraculous, and the last year of independence has been a real tribute to the leadership and the people of Kosovo, which is evolving into a multiethnic democracy. The president told me something I did not know, that since independence, not one Serb has left Kosovo, and in fact, others have returned. It’s that kind of confidence building and trust building that is essential to the future success of Kosovo, and I compliment you. PRIME MINISTER THACI: The support from the United States of America has been extraordinary at all times. We shall never forget the support, the strong support from President Clinton in 1998 and 1999, who with all its potentials, did everything that was possible in order to stop the crimes against our people and to have them all returned to their homes. Secretary Clinton was a person who herself visited the refugees from Kosovo in the ‘90s, and the memories of her visit will always remain fresh in the minds of our people. The people of Kosovo very much (inaudible) and are thankful for the continued support, as well as the strong position from President George W. Bush, who said enough is enough, and this is what happened. Now we are marking the first anniversary of the independence of Kosovo, and the fact that now we are standing close to Secretary Clinton is yet another sign that the support of the United States of America and its commitment towards Kosovo will continue. All the progress that we have achieved was a common progress, and we are committed and we pledge that we will continue to do so. SECRETARY CLINTON: Thank you all very much. Thank you, Mr. President. It is enshrined also in the United Nations Universal Declaration of Human Rights, and was reflected in President Obama’s Inaugural Address when he reminded us that every generation must carry forward the belief that all are equal, all are free, and all deserve a chance to pursue their full measure of happiness. To begin, not only will we seek to live up to our ideals on American soil; we will pursue greater respect for human rights as we engage other nations and peoples around the world. Now, some of our work will be conducted in government meetings and official dialogues. That’s important to advancing our cause. But I believe strongly we must rely on more than one approach as we strive to overcome tyranny and subjugation that weakens the human spirit, limits human possibility, and undermines human progress. We will make this a global effort that reaches beyond governments alone. I intend for us to work with nongovernmental organizations, businesses, religious leaders, schools and universities as well as individual citizens, all of whom can play a vital role in creating a world where human rights are accepted, respected, and protected. 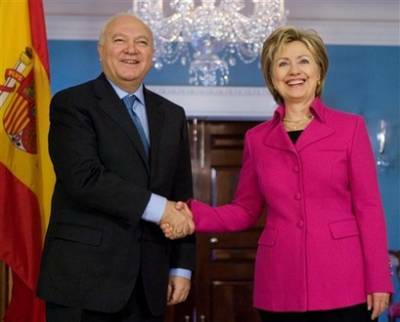 FOREIGN MINISTER MORATINOS: Good morning. QUESTION: Madame Secretary, can you say a few words about what you plan for the Gaza donors’ conference? SECRETARY CLINTON: Well, we are still working on that. We have made no decisions, and we are working across the government to determine what our approach will be. And I’m looking forward to attending. But you know, there’s still a lot of work to do. Thank you all very much. View Video SECRETARY CLINTON: Good afternoon. I’m so pleased to welcome you, Mr. President. SECRETARY CLINTON: It’s such a pleasure to have you here. 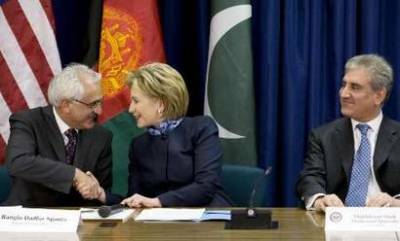 SECRETARY CLINTON: You know, there is so much work we’re doing, I’m so pleased to have so many good people helping me. SECRETARY CLINTON: Hello. This is a big week for Canada, and I just expressed the appreciation that we feel for the wonderful welcome and hospitality that President Obama received on his visit. And I’m delighted to have you here. 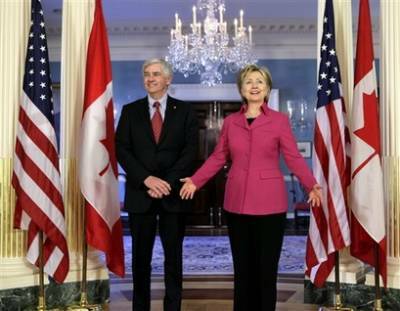 FOREIGN MINISTER CANNON: Well, I am very pleased to be here, Madame Secretary, and particularly after that great visit in Canada. And hopefully, we’ll have you there in Canada very shortly to be able to match that. FOREIGN MINISTER CANNON: I’m sure you’re going to be very well received as well. SECRETARY CLINTON: Thank you. I’m looking forward to it. I’ve always enjoyed my visits to Canada, and I had one memorable visit when we had a state visit, and I got to skate on the canals in Ottawa. That was a personal highlight, so thank you all very much. FOREIGN MINISTER CANNON: Thank you. QUESTION: The most important things. SECRETARY CLINTON: It is the most important thing. I’m just surprised you’re here covering this instead of out celebrating. (Laughter.) Nice to see you all. SECRETARY CLINTON: Good afternoon. I was very pleased to welcome the minister and his delegation here to the State Department. As you know, we are consulting very closely with the Government of Pakistan on our strategic review of our way forward. And I’m very grateful for the minister’s advice and counsel, and I look forward to further discussions and to having him back here tomorrow night for dinner along with his counterparts from Afghanistan.Thank you, Mr. Minister.FOREIGN MINISTER QURESHI: Thank you.